Left to Right: President of the Guyana Oil and Gas Association (GOGA), Bobby Gossai Jr; GOGA Director, Nigel Hughes; Resident Representative of the Inter-American Development Bank, Sophie Makonnen and Canada’s Ambassador to Guyana, Pierre Giroux at the launching of GOGA. The Guyana Oil and Gas Association (GOGA), which was launched Tuesday night, has its eyes set on ensuring transparency and accountability of transactions and adequate provision for Guyanese to be directly or indirectly employed. “GOGA will support all efforts which will lead to the fullest possible disclosure of all information on all transactions related to the exploitation of this national resources and encourage the widest possible discussion on the development of this asset,” one of the association’s director, Nigel Hughes, said in his remarks on the topic “Governance and Mandate of the Guyana Oil and Gas Association Inc. Experts estimate that the 1.2 billion barrels of oil will generate US$72 billion in earnings at today’s price. Based on the Production Sharing Agreement with ExxonMobil, that company would take 50 percent of revenue to recover its multi-billion dollar investment in exploration and the remainder would be split in half between the company and Guyana as profit oil. The association’s pledge came less than one month after Bank of Montreal representatives highlighted the importance for Guyana to have the experts who could assist in ensuring that oil producing companies release accurate data to government. Foreign Affairs Minister, Carl Greenidge and GOGA Director, Nigel Hughes unveil the association’s logo at Marriott Hotel. Formation of the association dates back to four years ago when Canada invited a small team of persons to the province of Newfoundland to observe how a community successfully managed the development of a similar resource. Today, more than 80 percent of goods and services to that industry are provided by the local community. 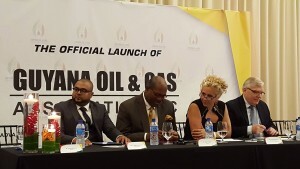 “The Guyana Oil and Gas Association has its origins in the deep commitment of its members to ensure that the development of this national resource is conducted in such a manner that Guyanese enjoy the maximum short, medium and long-term benefits from the responsible management of this asset,” said Hughes, a prominent Attorney-at-Law. The Directors are Nigel Hughes, Stuart Hughes, Andrew Mendes, Suresh Beharry, Alva Fernandes, John Chin, P. Fernandes and Anand Beharry. The President and Chief Executive Officer is Bobby Gossai Jr.
Gossai also pointed to the importance of transparency in interacting with the government, international community, non-governmental organisations, other private sector organisations and stakeholders to build a cohesive approach for the growth and development of Guyana’s hydrocarbon sector. “GOGA will undertake a transparent approach by working with all for the greater benefit within the value-chain of oil and gas to delivered to the country, investors, service providers and civil society,” said Gossai, a former senior employee of the then Ministry of Natural Resources and the Environment. In a global environment where multinational hydrocarbon companies have been changing the way in which they handle local content and in countries where there are or are not laws and regulations governing the participation and employment of citizens, the President and CEO said GOGA would be placing a lot of emphasis on that area. “It will be the effort of GOGA to work with various stakeholders on setting ambitious targets for local participation combined with mechanisms such as regulation, incentives, tariffs etc that afford the preference for domestic labour and suppliers,” he said. Gossai said his association would develop strategies for participation and employment of Guyanese based on the development of comparative, competitive, capable and sustainable supply of labour. Nigel Hughes said GOGA intends to become a major stakeholder in setting national policies and represent the interest of all Guyanese service providers to the oil and gas industry including drilling contractors, manufacturers, service companies, distributors, professional firms, financial institutions, consultants, engineers, pipeline producers, royalty-owners, end-users and others with interest. GOGA will encourage and collaborate with the Government to ensure that local capacity is given priority consideration, investment and funding for engineering , fabrication and construction services; logistics including marine, land and air; consulting, professional services and business office support; drilling well services and sub surface services; health and safety services; disaster management and consulting services, and local content & capacity development. Mr. Nigel Hughes also announced that GOGA intends to assist and participate in the provision of training, certification and capacity building in all related industries and fields. The association’s areas of primary interest include optimisation of exploration and production; maximisation of wealth creation, capture and distribution; the development of human capital; ensuring the establishment of robust & respected institutions and a strong regulatory framework; transparent governance; competitive and sustainable local energy companies; industrial development and diversification to create high value-added service industries; protection and enhancement of the natural environment; sustainable investment in social capital and the provision of industry recognised training and certification. Next year GOGA will be hosting the first of our annual international Oil and Gas Conferences here in Guyana. “International as well as local companies and operators will be afforded an opportunity to market their services to a global market while industry leaders will deliver presentations on the state of the industry and the optimal development of this asset,” he said.